Surprising yourself with a new look can be fun and refreshing! There's never a bad time to try out a totally different color. As a bonus: You'll get to show off your new look to your loved ones and friends. Going a little off routine is sure to make you feel spontaneous and fun. If you're used to having lighter hair, you'll get an even silkier shine by going dark. 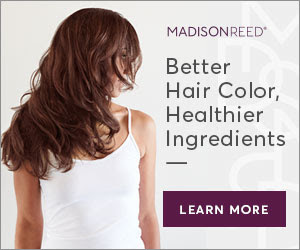 You could give a gloss treatment a try, like Madison Reed's Color Reviving Gloss. Be sure to flip and twirl your new hair to really show off that shine! Yup, we went there. Whether we like it or not, grays are here to stay—but there’s definitely something that can be done. The #1 advantage of going dark is that you can keep those grays at bay, and reveal a more beautiful and youthful-looking you! Check out Madison Reed's recent blog post for even more dark hair inspiration. And once you've made your decision, be sure to consult Madison Reed's Color Advisor tool and order your permanent hair color today. **This is a advertisement post which may contain affiliate links, I maybe compensated if you make a purchase after clicking on my links and/or for my time/services either monetarily or in products/goods.